A new tool is changing the way electronics is taught in the classroom at Northwestern — and its creators are offering it to the public through a wildly successful Kickstarter campaign. Developed at Northwestern University, the nScope is a small, portable USB-powered device that turns any laptop computer into an electronics workbench. It provides an oscilloscope, function generator, and power supply all on a small card — allowing users to build, measure, and test electronics and even acquire data onto their computers. Priced at less than $100, it’s ten times cheaper than the typical electronics workbench but still offers enough functionality that it is useful for both beginners and experts. 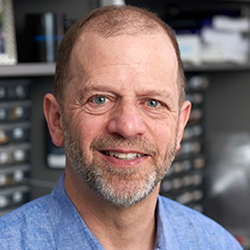 Michael Peshkin, a professor of mechanical engineering in the McCormick School of Engineering, calls the nScope a “game changer.” He previously sent his students to the lab, only to watch them follow cookbook-like instructions and hurry to leave. Believing that electronics design and experimentation should be fun, Peshkin longed to make the lab experience more exciting and dynamic. In 2008, he began cobbling together off-the-shelf parts to make the instrumentation portable and usable in the classroom, rather than the lab. The course that resulted, called Electronics Design, was immediately popular with students and soon part of the standard mechanical engineering curriculum. But the portable lab equipment was rather finicky and too expensive for students to buy and keep. 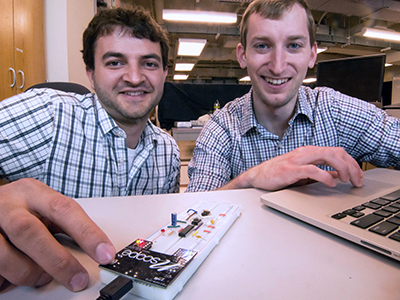 Recognizing they could create a better alternative, lecturer Nicholas Marchuk and graduate student David Meyer began work to develop an all-in-one portable electronics lab, which later became the nScope. Peshkin now requires his students to purchase the nScope for his course. At $100, a kit containing electronic components and an nScope is about the same price as a textbook, and students can keep the kit to use in their project courses and for desktop experiments in other subjects. The device’s portability ensures that experimentation is not tied to the classroom. Students can design and build circuits at home or with friends at any time of the day. nScope also has an open application program interface, allowing users to customize it for other programming languages, such as C, Python, and MATLAB. The nScope quickly gained popularity and is now used in several mechanical engineering and biomedical engineering courses at Northwestern. Acknowledging the increasing demand for the nScope, Marchuk and Meyer started a campaign on the crowd-funding site Kickstarter. Within days they passed their $25,000 goal to qualify for funding, and the campaign has since gone beyond $130,000.